Frederick Rockwell Moody '35 was a formidable opponent. A three-sport athlete, he lettered in football, baseball and boxing, but it was in boxing that he excelled. He had learned to box at high school in Penacook, N.H., and in his first year at UNH he quickly became the undefeated star of the freshman squad. So it was a crushing blow when, the day before the opening meet of the 1934 boxing season, Moody turned in his uniform and equipment to Coach Reed. The controversy erupted when Moody, who was black, was told that he would not be allowed to participate in the upcoming meet against the U.S. Coast Guard Academy. 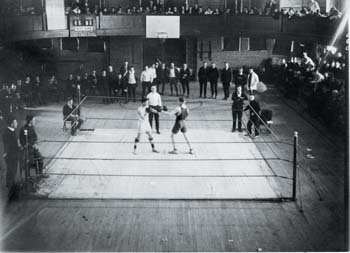 UNH had hosted the Academy in 1933: Moody had won his bout with a knockout in the second round. Before the 1934 rematch, the academy wrote UNH athletic director William Cowell to say that, "In view of the fact that the Superintendent of the Academy was from Georgia and a majority of the students were Southerners, it might be best if Mr. Moody did not make the trip to the Academy." They wanted to "prevent the recurrence of an embarrassing situation." Other UNH boxers threatened to resign, too. "Students at the University were very loud in their protests," reported Foster's Daily Democrat, "against what they consider unfair actions by the New London officials." The New Hampshire was inundated with letters from outraged students, who believed that UNH should have forfeited the meet rather than give in to racial discrimination. In a meeting with Moody and the team, Cowell explained that he had agreed to the request because there was only one other college on the boxing schedule. He believed Moody would make the sacrifice to save the schedule for the year. Mollified by Cowell's explanation and the support of his classmates, Moody rejoined the team, but did not go with them to New London. 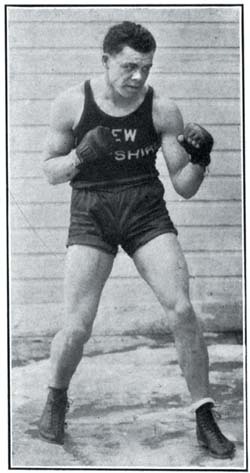 The following year, Moody was elected captain of the boxing team. Although the season was declared to be a success, only four bouts were scheduled and the following year, boxing at UNH quietly faded away.